As a specialized company in recruitment processes and human resources, in Melt Group we have observed that it is a widespread practice among candidates the use of the Europass CV. However, for us this is not the best way to make a good impression and get the job you’ve applied for. We have already talked about the characteristics of resumes before, talking about having an A+ resume and what do recruitment agencies value in them, but today we will delve into why you should not use the Europass CV. It is true that in some selection processes, the Europass CV is a must, but in other scenarios, it is not advisable to use it. This resume model completely depersonalizes the candidate, who happens to be one of a bunch, without highlighting any of its skills. You have to think that the resume is the primary way that you have to contact a human resources consultant or a company to find a job. When using a hackneyed model, it may even seem that the candidate shows little interest, and merely fills a range of experiences and skills in an already preconceived template. There is no history linked to the resume, only data, making it very difficult to stand out. One of the biggest disadvantages of the Europass CV, it is that it makes very hard to remember the candidate. 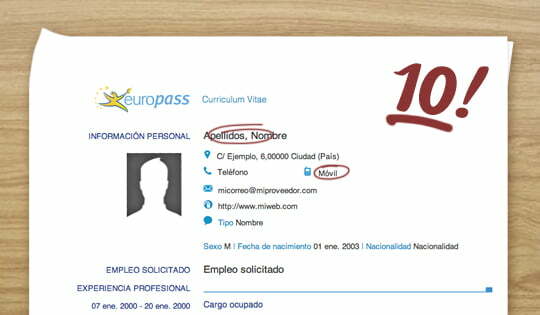 Consultants read dozens of resumes every day, and the Europass CV is much easier to go unnoticed. Candidates are mixed with each other, and when the consultant is looking for the candidate he really liked, he is not able to find it because they all look the same. The fact that the candidate chooses this format among all the available does not let him in good position, as it seems he is reusing the model because he used it in another selection process. If you respect yourself as a candidate, you respect those who are going to read your CV, and above all, you want to find a job, we recommend you not to use the Europass CV format. You will not get very far with it!